Alfre Woodard considers herself an “original gangster,” since after four decades in show business she has seen plenty of trends come and go. That includes the trend of including women or people of color in movies and television shows just because it happens to be fashionable at the moment, or because someone else had success doing it. “I’m an OG, and we have been through these things before. That does not mean I’m not millennial at heart – and I am hopeful and expect good to happen. I’m always willing to give it a chance. But I keep my balance because … we’ve been here before, as women, as people of color. I remember just the deluge of books by African-American writers, by Latino-American writers, by Chinese-American writers back in the ‘70s to mid-‘80s. And then all of the sudden, it’s like ‘Here’s a shelf for the black writers, here’s one shelf for the Latino writers.’ And it goes down to that at Barnes & Noble,” the four-time Emmy Award winner said Saturday during “An Evening with Alfre Woodard” at the Oklahoma City Museum of Art. A Tulsa native, Woodard returned to her home state last week to receive an Oklahoma Film Icon Award Saturday at Oklahoma City’s deadCenter Film Festival. The festival’s organizers invited me to interview her on stage after the award presentation. One of the most crowd-pleasing parts of our wide-ranging conversation came when Woodard revealed some hints about and thoughts on Season 2 of Marvel’s Netflix series “Luke Cage,” which will be released June 22. Set in Harlem, the superhero series stars Mike Colter as the titular character, an ex-con who has super strength and unbreakable skin after he was involuntarily put through a science experiment. Woodard plays Mariah Dillard, AKA Black Mariah, one of Luke’s rivals, an ambitious dirty politician who proved in Season 1 she will go to great lengths to remake Harlem according to her own ideals. “I don’t think of Mariah as a villain. She is somebody who’s willing to bend the rules to get what she thinks is a greater good. Yes, the world is littered with the aftermath of whatever good intentions that they had,” Woodard said. As previously reported, ScreenRant.com got the word out in April that almost half of the episodes of “Luke Cage” Season 2 would be directed by women, after no female directors worked on “Luke Cage” Season 1. The news came after the most recent Marvel Netflix release, “Jessica Jones” Season 2, boasted female directors for all 13 of episodes. Woodard was cautiously optimistic but not especially effusive about the decision to have almost half the Season 2 episodes of “Luke Cage” directed by women. ScreenRant.com reports that Lucy Liu helmed the “Luke Cage” second season premiere episode. She will be joined by Neema Barnette (“Queen Sugar,” “Being Mary Jane”), Millicent Shelton (“Jessica Jones,” “Runaways”), Kasi Lemmons (“Shots Fired”), Steph Green (“The Man in the High Castle”), and Salli Richardson-Whitfield (“Agents of S.H.I.E.L.D.”). “It’s so great that we’re mindful — and gotta keep saying it out loud to keep everybody mindful of it – but we have to change people’s hearts and minds. But we also have to, again, institute things that give it longevity. And as we do that, we have to still keep our responsibility of delivering,” she said. 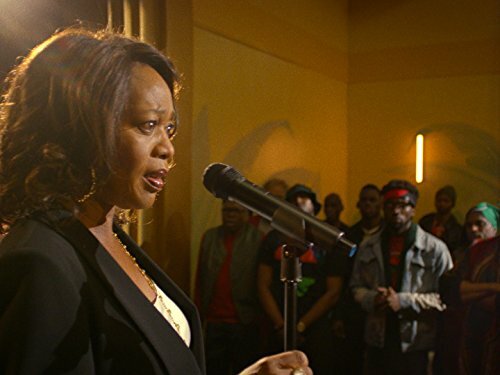 Along with Season 2 of Luke Cage, Woodard discussed some of her other upcoming projects, enthusing about lending her voice to Sarabi in the new version of “The Lion King” and the footage she has already seen; talking seriously about playing a prison warden in a men’s maximum security prison who develops a bond with the death row inmate she is scheduled to execute in the drama “Clemency”; and starring in another Netflix project, “Juanita,” an adaption of Sheila Williams’ novel “Dancing on the Edge of the Roof,” which Woodard’s husband, writer Roderick M. Spencer, wrote for her. “Juanita” stars Woodard as the title character, who gets fed up with her deadbeat grown kids and marginal urban existence. So, she hops a Greyhound bus to Paper Moon, Montana, where she reinvents herself and finds her mojo again. Like “Luke Cage” and Woodard’s recent stint playing Aunt Josephine in “A Series of Unfortunate Events,” “Juanita” will be showing on Netflix starting in fall. “So, Juanita takes off and she goes and has this great adventure – and I’m not gonna tell you the rest,” Woodard said with a smile. She also wouldn’t reveal much with an upcoming entertainment venture that’s going to be launching in fall. “I can’t talk about it right now, but there is another company that’s breaking into filmed entertainment that I’m going to be involved with starting in September – a really big company,” she said. But she confirmed that she is enjoying the opportunities streaming services like Netflix can offer for filmmakers, actors and storytellers. “The thing about Netflix that I love: Up until Netflix came along, it really was said, if there was a product that, say there’s 20 characters, if five of them were African-American, they’d say, ‘Oh, that’s a black film … and I can’t sell it abroad. There isn’t an international market for films with black and brown people in it, or with yellow and red people in it.’ So even if those films got done, they would just say, ‘OK, we’re gonna play it for a few weeks in the States somewhere.’ There was thing of saying, ‘Japan doesn’t want that product, Germany doesn’t want that product,’ the major markets they were going for. What Netflix did and just blew that whole thing out of the water was they said, ‘OK, we’re on in 150 countries, we’re gonna drop that all of the sudden at the same time. People in Tibet can watch it at the same time as people in Duluth watch it as the same time as people in Singapore. To see video of my interview with Alfre Woodard, click here.